By bouncing the light from your shoe-mounted flash forward, this Vello Light Bouncer with Cinch Strap Kit from B&H will help you create a soft, high-quality light source for flattering your subjects. 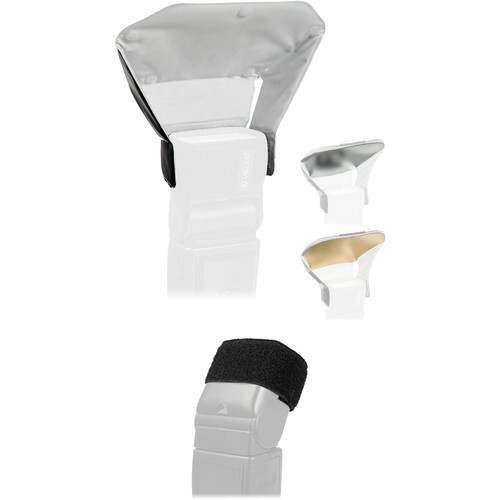 The bouncer is lightweight and portable and comes with gold and silver reflectors for changing the quality of light. Additionally, the strap bundled here is easily attached to the flash's head via hook-and-loop fasteners. This Vello Light Bouncer Kit for Portable Flashes spreads and redirects the light from a portable flash to soften the quality of light and distribute it over a wider area. No exposure compensation is necessary with automatic flashes, but operating distances will be somewhat reduced. The Light Bouncer can be used with slaves, or alone where low ceilings are not available, or where more direct but soft fill light is desired. It attaches to the flash head in seconds with the included touch-tab fasteners. The silver insert adds a specular look to highlights. The gold insert adds a warm tone to the scene, particularly useful for outdoor fill-flash. These inserts attach with touch-tab fasteners to the bounce surface of the Light Bouncer to further modify the light. Box Dimensions (LxWxH) 7.5 x 4.7 x 0.8"
Light Bouncer with Cinch Strap Kit is rated 3.0 out of 5 by 1.